A fabulous clear stampset from Woodware with five bare branched winter tree silhouettes in different shapes and sizes, along with a wintery ground stamp and a festive greeting. 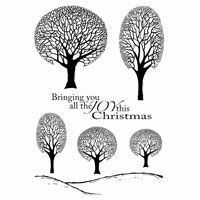 The trees look fabulous stamped in black on a white background and heat embossed with a crystal embossing powder. 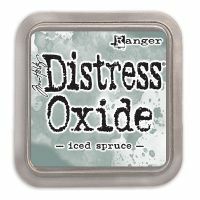 The shape of the trees makes it easy to cut them out once stamped and use in a variety of projects.